Manually lifting and moving heavy materials on your job site can cause strains, sprains and other injuries. These types of injuries are not only the leading cause of disabling injuries in the construction industry, but they also cost businesses billions of dollars. Although there is research and information available, this knowledge hasn’t necessarily made its way into contractors’ safety programs. To figure out the barriers to engaging in safer materials handling practices, CPWR staff surveyed contractors and used those results to formulate its new Best Built Plans program. The program, which is currently being piloted by a number of contractors across the country, aims to give contractors and workers the tools they need to safely handle heavy materials. 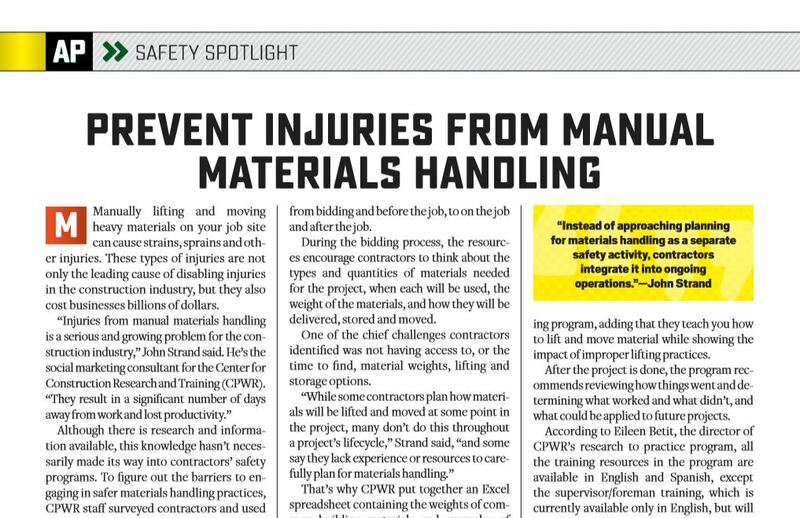 “Instead of approaching planning for materials handling as a separate safety activity, contractors integrate it into ongoing operations, from the time they bid a project, to the day it starts, and every day on the job,” he added. Best Built Plans is divided into two resources: a web-based site planning resource and a downloadable interactive toolkit of exercises available only for Windows-based PCs. The web-based site planning resource covers the manual materials handling process from bidding and before the job, to on the job and after the job. During the bidding process, the resources encourage contractors to think about the types and quantities of materials needed for the project, when each will be used, the weight of the materials, and how they will be delivered, stored and moved. One of the chief challenges contractors identified was not having access to, or the time to find, material weights, lifting and storage options. That’s why CPWR put together an Excel spreadsheet containing the weights of common building materials and examples of lower-weight options. The resource also prompts users to think about small changes they could make to minimize bending and lifting, like storing materials off the ground. They also remind contractors that materials weighing more than 50 pounds should be ideally lifted with the help of lifting equipment, or with the help of another person. Leading up to the job, Best Built Plans recommends reviewing materials’ management and addressing any changes to how the materials will be delivered, stored, lifted, moved and used, deciding which employee will be responsible for coordinating those processes, and reviewing safe lifting practices with employees. At the beginning of each day, the program suggests reviewing that day’s plan for materials movement and offers a suggested Toolbox Talk, including a QR code to two micro games that aim to encourage safe lifting practices. The micro games, Lift Coach: Plan Your Route and Lift Coach: Plan Your Lift, are free for iOS and Android devices. “The micro games can be played during lunch or breaks,” said Gary Gustafson, director of CPWR’s environmental hazards training program, adding that they teach you how to lift and move material while showing the impact of improper lifting practices. After the project is done, the program recommends reviewing how things went and determining what worked and what didn’t, and what could be applied to future projects. According to Eileen Betit, the director of CPWR’s research to practice program, all the training resources in the program are available in English and Spanish, except the supervisor/foreman training, which is currently available only in English, but will soon be available in Spanish. The downloadable training program includes interactive resources to help workers understand the need to plan lifts, and introduces strategies and best practices to reduce the risk of injury. Throughout the training program, workers are prompted with reminders and tips for safe lifting. For example, workers will learn warm-up stretches via an interactive demo where they can click on the body part involved in an activity. “While individual workers could use the program as a refresher on their own, it’s intended to be used in a classroom environment to teach, reinforce and demonstrate their role in planning for how materials will be handled and introduce safe practices to reduce risk for injury,” Gustafson said. “This is just a pilot at this point, so we’re very interested in getting feedback,” Betit said. She suggests volunteering to become part of the pilot project or using the materials and sharing your feedback through the online survey at the Best Built Plans website. The Best Built Plans program is available for free here.